The sheer volume of special features present in the Koi Princess slot, its broad wagering range, and decent prizes make it worth a look for anybody, really. 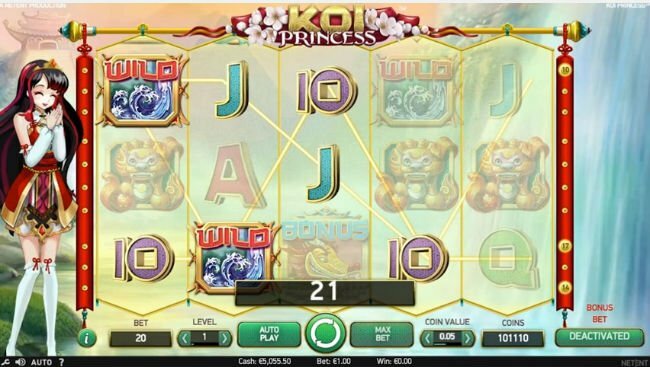 Koi Princess is a brand new video slot, which has been released by Net Entertainment. This slot is one of the first major Anime and Manga themed slots to be developed. 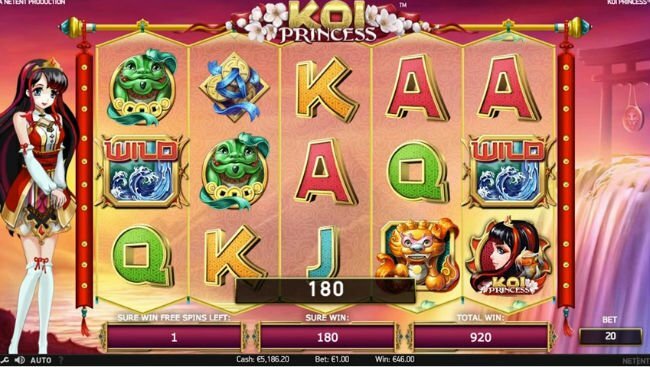 NetEnt have chosen to make the Koi Princess slot pretty standard in structure, since it features 5 reels and 20 paylines. There is nothing standard about the bonus rounds, though. 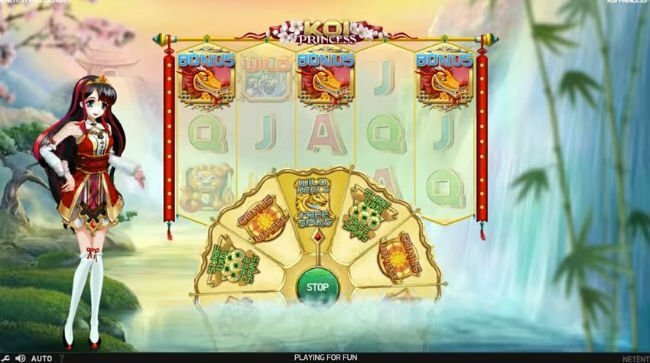 Discover just what they entail in our Koi Princess slot review. A lot will be made of the fact that the Koi Princess slot machine is designed with Anime, and why not? It hasn’t really been done before. The slot also takes in some of the more stereotypical elements of Japanese culture, and turns them into winning icons in the game, alongside the customary high playing icons. Koi Princess is not the most expensive slot you will ever come across, and you get a lot back for your money. The Koi Princess game allows players to select coin denominations of 1p up to £1, and they can bet as many as 10 of those per line. Paylines are fixed into place, so minimum and maximum wagers are going to vary from a low of 20p per spin, up to £200 per spin, respectively. The anime feel is manifested with style and great bonus games. There is certainly no shortage of bonus features in the Koi Princess slot. Koi Princess slot bonuses include seven amazing features. Four of these features could be triggered randomly after any base game spin, and they include the 5-Hit, random wild symbols, random wild reel, or bonus game features. The 5-Hit bonus guarantees you a 5-symbol combination win, whilst the wild bonuses are rather self-explanatory. If you get to spin the bonus wheel, you will get to land one of 3 additional special bonus games. Those features include the Sure Win free spins bonus (which we’ll come to in a moment), the Wild Reels free spins bonus (which offers wild reels to win on), and Coin Win bonus, which promises an instant cash prize. The main bonus round in the Koi Princess slot machine is the Sure Win Free Spin bonus. Every single spin you make in this bonus will guarantee you a win. These wins are kind of progressive, because you are guaranteed to win what you bagged on your previous win or more. For instance, if you scooped a win worth £1 on your first free spin, then you second free spin is guaranteed to be worth £1. If you won £5 on your third spin, then your fourth spin would be worth a guaranteed fiver, and so on.